This half term Silver class are studying the Literacy book Jack and the Beanstalk and are working on writing, reading, speaking/listening and art crafts linked to the story . We are also hoping to act the story out and try some hot seating as Jack and the Giant. In Maths we will be re-visiting topics such as addition, tally chart, estimation, 3d shapes and money. Our topic is ‘How does your garden grow’ and we will be looking at the life cycle of a flower and a plant. We will be doing art crafts linked to the garden and growing our own cress, beans and sunflowers. We will be experimenting by growing beans in different areas such as in the sunlight and in the dark to see where they grow best. Later in the summer we are going to be visiting Leighton Buzzard Splash Park. This half term Silver class will be studying the Literacy book Paddington by Michael Bond Illustrated by R.W.Alley. Paddington Bear first met the Brown family at a railway station – Paddington station, in fact. He had travelled all the way from Darkest Peru with only a jar of marmalade; a suitcase and a label reading ‘Please look after this bear’. Without further ado, Mr and Mrs Brown promptly welcomed the adventurous bear into their family, and in honour of their meeting place they named him Paddington. We will doing lots of writing, reading, speaking and listening, ICT and cookery activities linked to this story. We will also look at Paddington at the Palace to link to our Topic Town and Country. During this Topic we will be looking at different houses and things that you are likely to see in the Town and the Country. We have trips planned to Dunstable town, Warden Hills, Pets at Home and a trip on the train to Harpenden. In Maths we will be working on Number and revisiting Estimation, Tally charts and Addition. We will be working on Money during snack time by having a mini tuck shop. This half term Silver class are studying the Literacy book The giant jam sandwich and the children have been participating in lots of different activities linked to the book. One hot summer in Itching Down four million wasps flew into town. Topic is Pictures, Paintings and Photographs and the children are studying a different artist each week such as Kandinsky, Seurat and many others. The children are also creating their own version of the Draw me a star book. We will be having an exhibition to display all of the children’s artwork at the end of the half term. This half term the children are studying the Traditional Tale Snow White and the seven dwarfs. The children are participating in writing, speaking/listening, reading, art activities linked to the story. Year 4 Christmas Performance is also linked to the story and the children are now beginning to rehearse for the performance. The children appear to be enjoying the story and are answering simple questions based around the story. Topic this half term is Let there be Light and each week we are studying a different theme these are Bonfire night, Halloween, Diwali, Chinese New Year, Hannukah and Christmas. We have trips to Mead Open Farm and a church in Stopsley and we hope to walk into Luton town centre to see the lights. We are busy getting ready for the Winter Wonderland and the children will be making gifts to sell on our stall. This half term we are studying the book The Very Busy Spider and have already been very busy participating in writing, computing, cooking and art crafts linked to the story and the children really appear to be enjoying the story. We are especially enjoying using the story strips to order the animals in the story and using the soundboard of the activities. 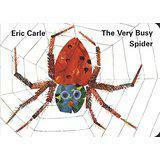 A beautiful and classic picture book from Eric Carle - The Very Busy Spider. Early one morning a little spider begins to spin her web on a fence post. In this multi-sensory book, children can feel the pictures as well as see them, while they hear or read the easy rhythmic text.Alongside the visual excitement of Eric Carle's vibrant collages of familiar animals is the tactile experience of feeling the spider's web as it grows from a simple line into a complex and beautiful creation -a perfect story for reading aloud and sharing. Topic this half term is ‘ What a load of junk’ and we will be looking at metal, plastic, glass, recycling of junk and improving an area in the school environment. We have trips to the re-cycling centre in Limbury, charity shops in Luton and to Ashridge Park to do some bark rubbings.